Whether you prefer your fruit, juiced, blended in a smoothie, freshly cut, accompanying dessert or just bought in bulk then you are in luck. Thailand has it all and most likely it will be right on the street in front of you. 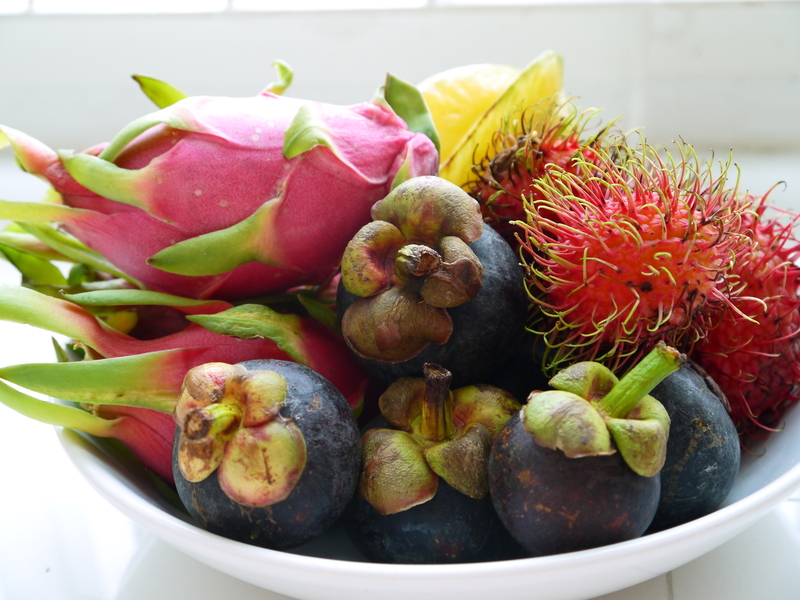 There is an abundance of fruit in Thailand and it is affordable, easy to find and delicious to eat. 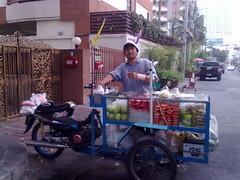 When buying fruit in bulk (more than a kilo) I prefer to go to the Pra Khanong Market near my home in On Nut. The block where the market is bordered by Sukhumvit Road, the Prakhanong Canal and Thanon Pra Khanong (Sukhumvit Soi 71). Along Sukhumvit Road on the edge of the market is stall after stall of fruit vendors, selling what is currently in season at great prices. Markets generally offer the freshest fruit and vegetables, often fresher than the supermarket and cheaper too. Often in New Zealand we had to wait until the Sunday farmers market to buy our fruit but in Thailand we don’t have to wait. Because everyday fruit is easy to find. I think we might even eat more fruit in Thailand partly because it so delicious but also because there is so much variety. We generally have fruit for breakfast most days and always have a bowl of fruit ready to be eaten. If I’m out and about and feeling peckish or just feeling too lazy to walk to the market I’ll get some fruit from a push cart. The fruit comes already cut up and is often chilled (having been sitting on ice). Another favourite way of having fruit is either juiced or as a smoothie. Satisfying two needs at once a refreshing drink and lots of vitamins. But better yet is fruit as dessert. Fresh orange juice and deep fried bananas. If you’ve walked into a Foodland or Emporium (I think that’s the name; they’re the “luxury” supermarkets along Sukhumvit), and check out the refrigerator/produce sections, you might see some unique juices. Asiatic pennywort, roselle and bael come to mind- though the first two aren’t fruits – those supermarkets are good places for a random potation. Thanks for that. I love trying new drinks and Thailand has a whole bunch with some interesting names and favours. I’ll have to check these out.